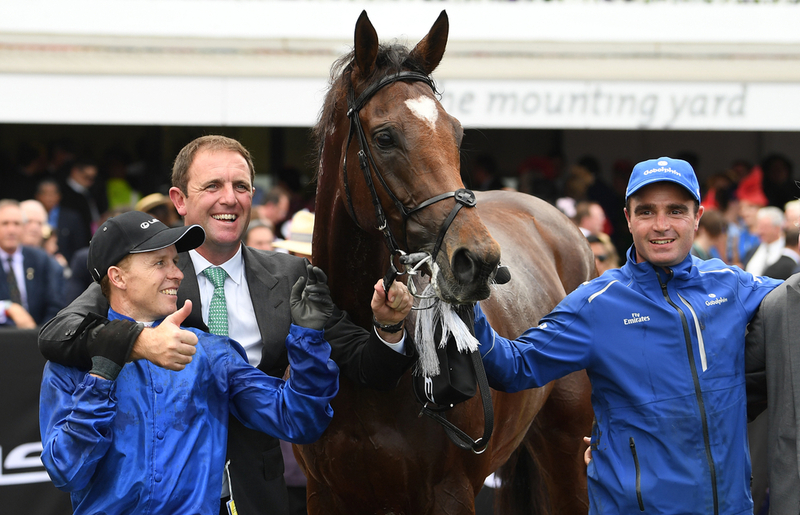 Charlie Appleby began this monumental year, by winning his first Epsom Derby back in June, in what was also Godolphin's first ever success in the race's history. Masar ran out an impressive 16/1 winner for Appleby, with William Buick in the saddle, beating De Ex Bee into second and subsequent Eclipse and Juddmonte winner Roaring Lion back in third. Favourite Saxon Warrior - for Aiden O'Brien, only managed fourth. However this was outstanding bit of training from Appleby, with Masar - despite romping home in the Craven, always seeming to find one better over a mile. He was stepped up in trip, and rewarded connections with an emphatic win in the Classic, and we cannot wait to see him return from injury! Charlie Appleby sent Blue Point for the Kings Stand Stakes at Royal Ascot, praying the horse would relish the minimum five furlongs, over the lengthier six. His decision paid off, and Blue Point; who has definitely shown his best form over five, landed the Group 1 sprint on the first day of Royal Ascot, comfortably seeing off, arguably the world's fastest horse in Battaash. Mabs Cross - eventual l'Abbaye winner was third, and Lady Aurelia, last year's winner, was beaten very early on and could only manage seventh. Blue Point went onto beat Battaash again when finishing third in the Nunthorpe at York - a track the Charlie Hills sprinter just does not seem to handle. But another fine piece of training by the Godolphin marksman. Line Of Duty - who showed plenty of promise in a maiden at Goodwood only in September, jumped up to the big time in fine style, by landing the Juvenile Turf in the Breeders Cup on Friday evening. This is arguably the best piece of training from Appleby, as Line Of Duty showed multiple signs of greeness at the glorious course only eight weeks ago. He has managed to put that right, and the horse scored at Chantilly in the Prix de Conde for his preparation run in early October. Line Of Duty eventually straightened up the home run at Churchill Downs on Friday, and got up to beat Uncle Benny and Somelikeithotbrown close home. Has a bright future. Jungle Cat won the Sir Rupert Clarke Stakes for Appleby and James Doyle in late September, which provided the duo with yet another international Group 1. Heavily un-fancied before the off, the interest was in another Godolphin runner Home Of The Brave before the off, but Jungle Cat made his layers pay, with a narrow success at Caulfield. The 6yo still proving, that age is just a number. Finally, of course, Charlie Appleby capped off a sensational year last night, by winning 'the race that stops a nation' for the first time, and for the first time for England. In fact, Appleby's runner Cross Counter, led home a 1/2/3 for the Brits, with the Hughie Morrison-trained Marmelo a length down in second, and Prince of Arran for Charlie Fellowes, back in third. Another eye-catching training performance, as 2m was unknown territory for this lightly raced 3yo, having only raced over a 1m4f in his last four outings. We knew the ability was there, having won the Gordon Stakes at Glorious Goodwood, but he proved his stamina last night, when circling the entire field on the home turn on route to victory. The English trainer had to hunt around for the right jockey for his one and only runner, as William Buick could not make the weight. In came Kerrin McEvoy, who did a fantastic job behind the wheel, to land what was his, third Cup.